The April blues won’t stop for the Los Angeles Dodgers. 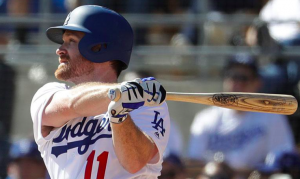 On Sunday, the Dodgers placed infielder Logan Forsythe on the 10-DL because of inflammation in his right shoulder. The club doesn’t expect it to be a long-term issue. Nevertheless, it’s at least 10 days without one of their everyday players, as the Dodgers look to break out of an early-season slump. Infielder Breyvic Valera has been called up to take Forsythe’s spot on the roster. Forsythe was removed during in the 6th inning of Saturday’s loss to the Diamondbacks. He had complained of soreness while throwing the ball to first base while playing third base. After the game, Forsythe underwent an MRI that revealed inflammation in his shoulder but no structural damage. At the moment, the Dodgers are hopeful that 10 days of rest on the DL will be enough time for the issue to dissipate. However, there is no guarantee that will end up being the case. According to Roberts, Forsythe had experienced shoulder soreness during spring training. When Justin Turner broke his wrist late in spring, Forsythe was forced to become the team’s primary third baseman. The longer throws Forsythe needs to make as a third baseman have not agreed with his shoulder, causing the condition to worsen. He’s already made four errors this season at the hot corner. Things haven’t gone much better for Forsythe offensively this year. He’s currently hitting just .174 with an OPS of .507. But with Turner still on the shelf for the foreseeable future, Forsythe was someone the Dodgers couldn’t afford to lose to injury. With both Turner and Forsythe on the sidelines, third base figures to be a timeshare between Kyle Farmer and Enrique Hernandez. Farmer is a natural catcher who’s been converted into an infielder. He also has fewer than 40 big league at-bats. Hernandez can play anywhere on the diamond, although he has just a dozen career starts at third base. He’s also hitting just .182 on the season. Hernandez has also been needed at second base, Forsythe’s preffered position, as part of a platoon with Chase Utley. Unless he can get it going offensively, more playing time for Hernandez is not what the doctor ordered for the Dodgers. It will be interesting to see if Roberts gives Valera to play. While he’s a natural second baseman, he’s started over 50 minor league games at the hot corner. Valera is also a career .303 hitter in the minors who also brings plenty of speed to the table. At this point, the Dodgers should be willing to try just about anything. Turner is not yet swinging a bat, so there is no timetable for his return. Meanwhile, Forsythe will miss at least 10 days. That’s half of the Los Angeles infield on the shelf for the foreseeable future with little depth behind them. On paper, the Dodgers should be a team that can overcome a few injuries. But that hasn’t been the case early in the year, as they began Sunday at 4-9. With Forsythe going to the DL, things could get worse before they get better.